As I was saying earlier, everyone in Sarajevo seems to have a story. We were lucky enough to be staying at a hostel with a war survivor, Yasmin, that was willing to tell us his story. 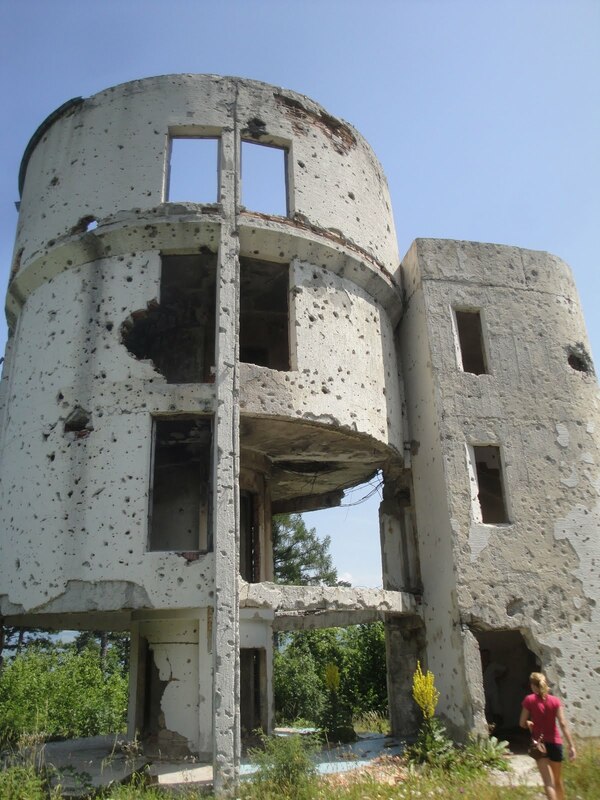 For fifteen euros, he drove us through the mountains into the Republika Srpska, one of the larger political divisions of Bosnia & Herzegovina, and brought us to the frontline of the siege on Sarajevo. Our first stop was at the ice luge from the 1984 Sarajevo Winter Olympics. What had once been part of a symbol for international cooperation had been destroyed during the destructive war. We continued on to what had once been a cable car going from the center up to the mountains. 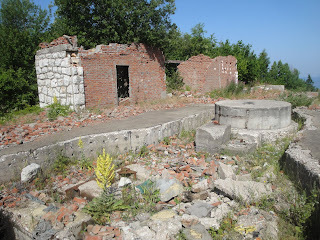 During the war, it was used as a bunker. We then picked our way through the woods as Jasmin told us of his personal experiences. Several times during the tour he would stop and talk of the death of one of his friends or areas that had seen particularly hard fighting. It was really moving. 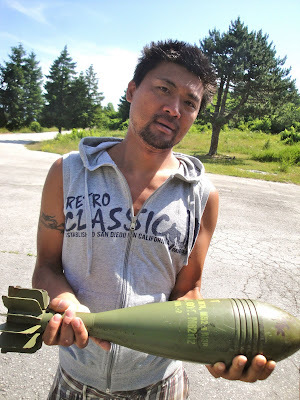 Near the end, he showed us this mortar that landed in his neighbor's garden. Luckily, it did not detonate. One of the concerns of the mountains surrounding Sarajevo is landmines. 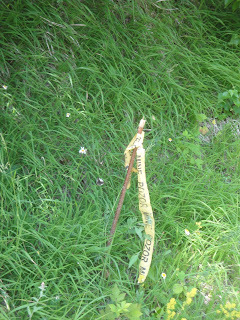 Although the city government has said that the area is clean of mines, people have still been injured in recent years. 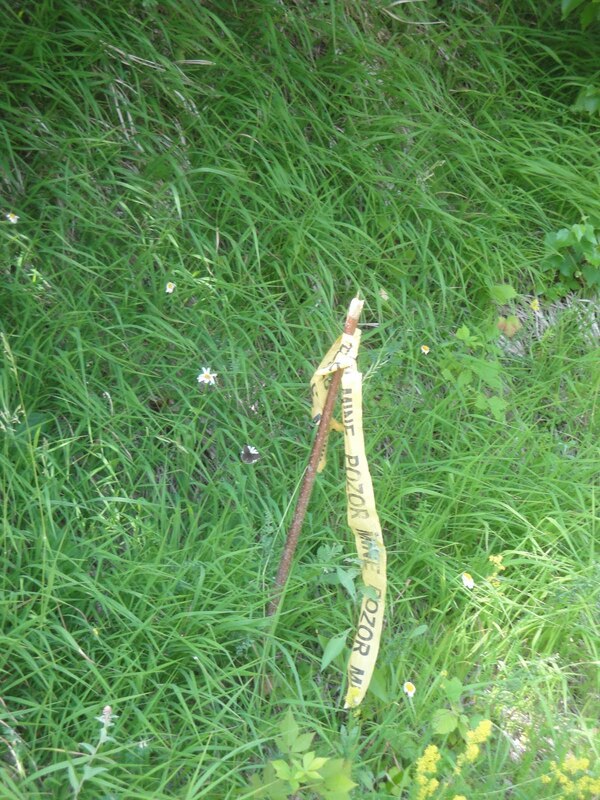 There are yellow flags up that warn about areas or specific spots that may have landmines. 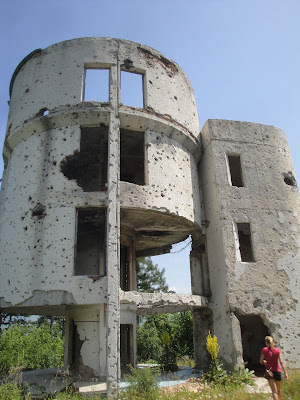 At one point, we were walking single-file behind Yasmin in order to avoid mines that may have still been between the Serbian front line and Sarejevo's. A great experience, and if you are ever in Sarajevo, you should take the Yasmin tour.